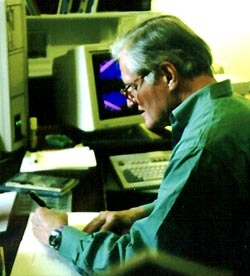 Ashbery is the author of numerous books of poetry and he has been awarded virtually every significant prize for American poetry, including the Yale Younger Poets Prize, the Lenore Marshall Poetry Prize, the Pulitzer Prize for Poetry, the National Book Critics Circle Award, the Ruth Lilly Poetry Prize, Harriet Monroe Memorial Prize, the Frank O’Hara Prize, the Shelley Memorial Award, and the National Book Award. More information about the poet and examples of his work can be found at the Academy of American Poets site and the Bollingen Prize for Poetry site. A list of all the 2008 Yale honorary degrees is available from the Office of Public Affairs: 2008 Honorary Degrees. Photograph of John Ashbery by John Tranter; Tranter’s interview with Ashbery is available in Jacket Magazine. An archive of correspondence, writings, and printed material by or relating to the poet Frank Stanford (YCAL MSS 295) are now available for use at the Beinecke Library.Stanford was born in southeast Mississippi in 1948.In the following year he was adopted by Dorothy Gilbert, and in 1952 relocated to Arkansas when Gilbert married Albert Franklin Stanford.Remembered as a bright and athletic child in his early youth, the young Frank Stanford was greatly affected by the knowledge of his adoption.He entered the University of Arkansas in 1967 as a student of Civil Engineering, but later on switched to study literature, and was well known in the Fayetteville literary community for his poetry.He wrote poems for the student literary magazine, Preview, and many of the early poems following his college years were published in journals such as Field, Ironwood, and American Poetry Review. Stanford left college without earning a degree.In 1970 he met Irving Broughton, editor and publisher of Mill Mountain Press, who published Stanford’s first book, The Singing Knives.Between 1970-76, Mill Mountain published five more of Stanford’s books.Also in the early 70s, Broughton and Stanford made a documentary film about Stanford’s work and life.The film—It Wasn’t a Dream it Was a Flood—won the Best Experimental Film Award at the West Coast Film Festival in 1975.The following year saw the birth of Stanford’s own publishing company, Lost Roads Publishers. Lost Roads sought to “reclaim the landscape of American poetry” by publishing little known authors, whom the poet C.D. Wright, succeeding Stanford as editor, called the “the beautiful wild poets we grow from the road.”In 1977, Lost Roads Publishers and Mill Mountain Press joint-published Stanford’s epic poem, The Battlefield Where the Moon Says I Love You, a manuscript of over 15,000 lines of poetry that Stanford had been working on sporadically since his early teenage years. On June 3 1978, at the age of 29, Stanford took his own life in his home in Fayetteville, Arkansas.His chapbook Crib Death came out shortly afterwards.Lost Roads published more of his poems in You in 1979, and a collection of his short fiction Conditions Uncertain And Likely To Pass Away in 1990.The following year the University of Arkansas Press published The Light the Dead See: Selected Poems of Frank Stanford.Amongst the collection in Beinecke are many of Stanford’s yet unpublished manuscripts, drafts and notebooks.There are photos, music, notes from his daily life alongside articles and journals commemorating his work, amongst a miscellany of other collections. Related materials may be found in the Library’s Finding Aid Database and Uncataloged Acquisitions Database; copies of Stanford’s books in the Yale Libraries can be located by searching Orbis, the Library’s catalog. Collection description prepared by Shu-Han Luo, Y’09.